Is it a Doulton Lambeth Jardinaire by Hannah Barlow? I haven’t really payed any attention to the jardiniere and it has sat on the shelf in the spare bedroom since I bought it. 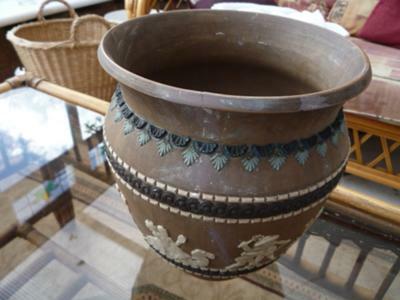 I paid £20.00 for it when i purchased it and the stall holder told me at the time that it was a Doulton Lambeth piece and was decorated by Hannah Barlow. I would really like to know if this is true or did I fall for a bit of sales patter. I have looked up the marks and it is Doulton Lambeth but i do not know the marks for Hannah Barlow. Would love it if anyone could point me in the right direction? Hi Judy, It would’ve been better if you could have uploaded a photo of the marks on the jardineire. From the angle the photo has been taken it really is difficult to see whether it is Doulton Lambeth or in the early style of Hannah Barlow. However, you can find information about Hannah Barlow on the Doultons Hannah Barlow page. You will find Hannah’s signature mark on the Doulton Artist Marks (B) page.